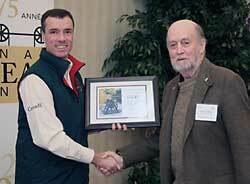 Gavin Liddy, Superintendent of the Rideau Canal (left) presenting award to Ed Bebee, Chairman of Friends of the Rideau. 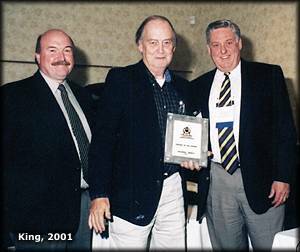 At the 5th Rideau Waterway Symposium on November 26, 2007 - Friends of the Rideau was presented with a Certificate of Recognition, following a stirring speech in praise of our organization by Superintendent Gavin Liddy. Gavin presented the award to Friend's Chair, Ed Bebee. 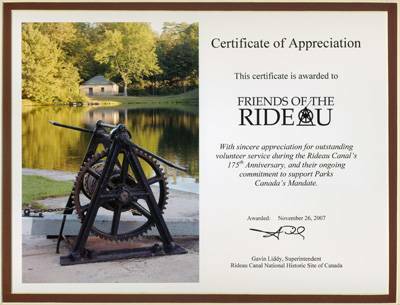 The certificate recognizes our outstanding volunteer service during the Rideau Canal's 175th Anniversary, and our ongoing commitment to Parks Canada's mandate. 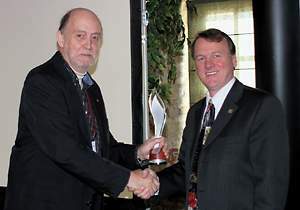 At the 4th Rideau Waterway Symposium on November 22, 2006 - Friends of the Rideau was presented with the "Volunteer Flame" - the Parks Canada Co-operating Association Award. 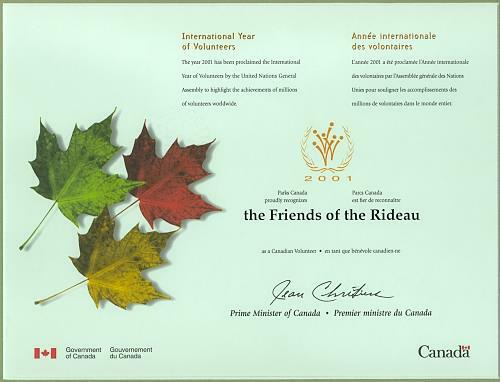 This award was presented to Friends' Chair, Ed Bebee, by Alan Latourelle, Chief Executive Officer, Parks Canada in recognition of the volunteer role Friends of the Rideau has played over the past 21 years in terms of visitor experience, public education and protection of the Rideau Canal. 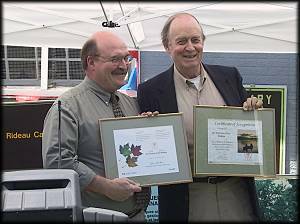 Alan Latourelle, Chief Executive Officer of Parks Canada (right) presenting award to Ed Bebee, Chairman of Friends of the Rideau. Doug Stewart, Superintendent of the Rideau Canal (left) presenting awards of recognition to Ed Bebee, Chairman of Friends of the Rideau. 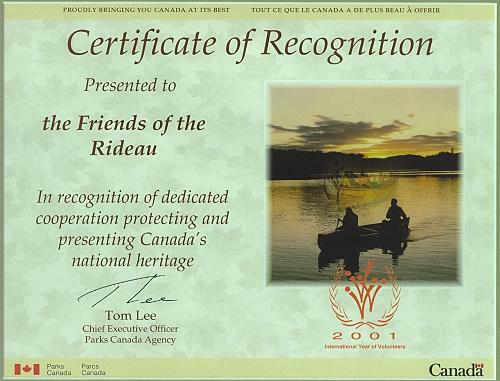 On July 7, 2001, Friends of the Rideau was awarded two certificates of recognition. Doug Stewart, Superintendent of the Rideau Canal was on hand to present the awards to Ed Bebee, Chairman of Friends of the Rideau. The ceremony took place in Merrickville, at The Depot, the retail outlet and Rideau Interpretive Centre run by Friends of the Rideau. Doug noted the work that Friends has done since its formation in the early 1980s in working to protect the canal and raise public awareness about the Rideau Canal National Historic Site. Special mention was made of some of our recent projects, including this website, the printing in 2000 of a new book about the canal, A History of the Rideau Lockstations authored by Friends' director Ken Watson, and most recently, getting the definitive work about the Rideau, Robert Legget's book Rideau Waterway, back into print. Doug Stewart, Superintendent of the Rideau Canal (left), Ed Bebee, Chair of Friends of the Rideau, and Paul Akehurst, Chair, Rideau Canal Advisory Committee. 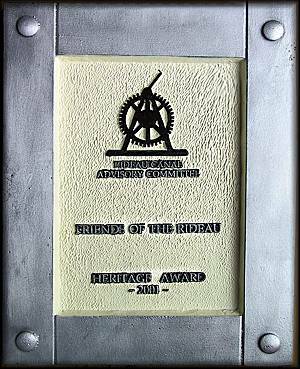 On November 5, 2001, at the first Rideau Waterway Symposium, Friends of the Rideau was awarded a plaque by the Rideau Canal Advisory Committee recognizing our efforts over the past 16 years at presenting Rideau heritage. Recent examples of our work that were cited included the publication of a new book about the Rideau, A History of the Rideau Lockstations, written by Friends' Director Ken Watson in 2000, the re-publication of Dr. Robert F. Legget's book, Rideau Waterway in 2001, and the creation of this website (in 1997). This weighty award (literally, the plaque weighs in at about 2 Kg), was presented to Ed Bebee, Chair of Friends of the Rideau by Paul Akehurst, Chair of the Rideau Canal Advisory Committee. Needless to say we were very pleased to receive this award.